ADR stand for "Automated" or "Automatic" Dialog Replacement. re-recorded in a process called looping or ADR. An actor watches the image repeatedly while listening to the original production track on headphones as a guide. The actor then re-performs each line to match the wording and lip movements. Actors vary in their ability to achieve sync and to recapture the emotional tone of their performance. freeze a performance until he knows its final context. ADR is usually considered a necessary evil but there are moments when looping can be used not just for technical reasons but to add new character or interpretation to a shot. Just by altering a few key words or phrases an actor can change the emotional bent on a scene. 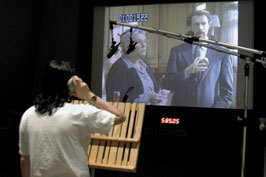 The way ADR is treated and approached is symptomatic of how little respect sound gets in the movies. You march the actor into a cold sterile room and usually give them no time to get into the character or rehearse. They are expected to just start performing a few minutes after they walk into the room. The emphasis is almost always on getting the dialogue in sync instead of getting the right performance. Of course the majority of the actor's brain is then occupied with whether his lips are flapping at exactly the same rate as they were on the day that the camera was rolling. It is no wonder that most ADR is not very good. In the final mix, directors almost always prefer the production sound, even if it is noisy and distorted. One of the things you do with ADR to make it sound more like production sound is to pitch it up. ADR is almost always delivered at a lower pitch because the actor doesn't have the energy he/she had on the set. In the excitement of the shooting set the actor tends to talk louder and higher. In an ADR session, the director typically has to push the actor to get them anywhere near the level of vocal performance that came from the set. Read "Orson Wells and ADR"
A comprehensive and detailed guide to the craft of dialogue editing. Recommended!! Ambience is widely used as a synonym for ambient sound. Ambient sound consists of noises present i the environment. In film and video sound production term Ambience usually means the background sound accompanying a scene. Ambience is used for background sounds..
(2) deliberately added in sound-effects editing in order to provide an acoustic space around the rest of the dialog and sound effects. In the trial scene of Philadelphia - instead of using reverb to a voice as the convention says for hallucinating - sound designer Ron Bochar used subjective ambience. He dropped the previous room tone and shifted the ambient sound. He also changed the spatial placement of the ambient sound - from left, right, and center speakers to surround speakers. Ambience helps establish the scene and works editorially to support the picture editing by, for example, staying constant across a picture cut to indicate to the audience that no change of space has occurred, but rather only a simple picture edit. Conversely, if ambience changes abruptly at a picture cut, an indication is made to listener that the scene also has changed.